Coming to see the Pirates at PNC Park? Here are our recommended parking options. The Pirates strongly encourage fans, especially families, to arrive as early as possible or find alternate parking in the Golden Triangle in one of the seven Pittsburgh Parking Authority Garages for $6.00 and take advantage of the free "T" service or enjoy the walk across the Clemente Bridge. The Pirates strongly encourage all fans to download the "ParkPGH" app or visit m.parkpgh.org to check for downtown parking space availability throughout the season. If you're coming from the NORTH, you should park in the NORTH. 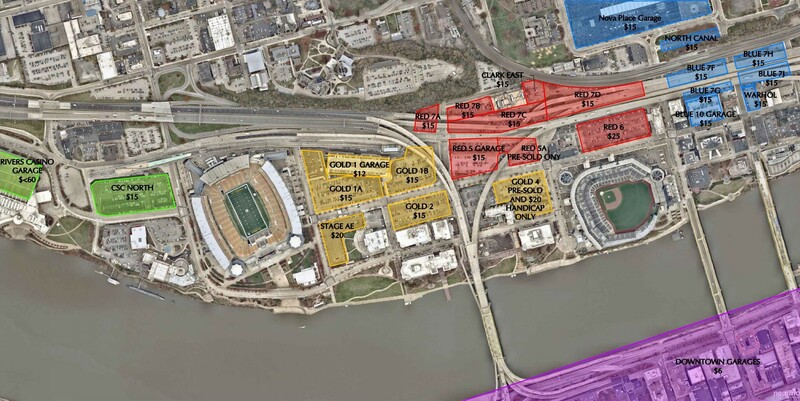 Your best parking choice is to use one of the North Shore surface lots or garages around PNC Park. By staying on the North Shore, you'll have the easiest access, to and from the ballpark, to I-279 North, Route 65 or Route 28. If you are coming from the north, your parking choices on the North Shore include lots 7A, 7B, 7C or 7D, the surface River Road lots, Allegheny Center garage and North Shore Garage. If you're coming from the SOUTH, WEST or EAST - parking downtown will be best for you. You can then get to the ballpark by walking over the Clemente Bridge. With many parking options downtown costing only $6.00 on game days, it's an easy and cost effective way to get to the ballpark! After the game, if you are going SOUTH or WEST, you'll have easy access to the Ft. Pitt Bridge via Stanwix ramp or Liberty Avenue ramp or to the Liberty Bridge / Tunnel via 6th Avenue. If you're headed EAST, you'll have easy access to I-376 (Parkway East) via the Seventh Avenue ramp or Stanwix, Wood and Grant Street ramps. *The First Avenue garage connects to and from the new First Avenue "T" station. Fans can ride for free to the Wood Street Station and enjoy the walk across the Clemente Bridge to PNC Park. There are nearly 50 other parking lots /garages downtown. The best part is... it's only a five-minute walk over the Roberto Clemente Bridge to PNC Park making parking downtown very convenient.